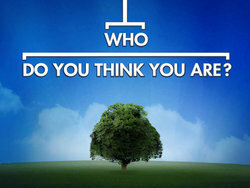 For the UK series of the same name, see Who Do You Think You Are? (UK TV series). Who Do You Think You Are? is an American genealogy documentary series that is an adaptation of the British BBC series of the same name. In each episode, a different celebrity goes on a journey to trace parts of his or her family tree. The series is a partnership between Shed Media, NBC Entertainment and Ancestry.com with executive producers including Alex Graham, Pam Healey, Lisa Kudrow, Dan Bucatinsky, Stephanie Schwam, and Al Edgington. The show premiered on NBC on March 5, 2010 where it ran for three seasons before being cancelled in 2012. It was then picked up by TLC, where it has aired for seven additional seasons. The series has been renewed for an eleventh season which premiered on December 3, 2018 and features Mandy Moore, Regina King, Josh Duhamel, and Matthew Morrison. In early 2009, it was announced that NBC had ordered an American adaptation of the British series Who Do You Think You Are?. It was reported that Lisa Kudrow was set to executive produce the series as well as participate in one of the first-season episodes. The show premiered on NBC on March 5, 2010, as one of the replacement shows of The Jay Leno Show at the ten o'clock hour. NBC renewed the series for two subsequent seasons before cancelling it in 2012. After the cancellation the series was then picked up by TLC, where it has aired for six additional seasons. On August 25, 2017, TLC renewed the series for a tenth season. NBC ordered a second season for the reality series on April 5, 2010. The second season of the series began on February 4, 2011, and consisted of eight episodes. The first episode featured Vanessa Williams. Following episodes featured Tim McGraw, Rosie O'Donnell, Kim Cattrall, Lionel Richie, Steve Buscemi, Gwyneth Paltrow and Ashley Judd. Cattrall's episode is an edited version of the original one that she made for the British series in 2009. The show was renewed for a third season by NBC on February 22, 2011, and aired during the 2011–2012 television season. The 12 celebrities included in season 3 were Marisa Tomei, Rob Lowe, Paula Deen, Rashida Jones, Jerome Bettis, Reba McEntire, Helen Hunt, Edie Falco, Rita Wilson, Jason Sudeikis, Martin Sheen and Blair Underwood. The show returned on February 3, 2012. After being cancelled by NBC, TLC picked up the series and the new season began on July 23, 2013. Celebrities taking part in the fourth season were Christina Applegate, Cindy Crawford, Zooey Deschanel, Chelsea Handler, Kelly Clarkson, Trisha Yearwood, Jim Parsons and Chris O'Donnell. TLC renewed the show on September 10, 2013. The season premiered on July 23, 2014 and featured Cynthia Nixon, Jesse Tyler Ferguson, Rachel McAdams, Valerie Bertinelli, and Kelsey Grammer. Initially, an episode featuring Lauren Graham was planned but cancelled. Just like Kim Cattrall's episode, the network chose to air an edited version of an episode that Minnie Driver had made for the original BBC series in 2013. ^ The episode also featured McAdams' sister Kayleen McAdams, a Hollywood make-up artist. Season 6 premiered on March 8, 2015. Season 7 premiered on July 26, 2015. This season featured Ginnifer Goodwin, J. K. Rowling, Alfre Woodard, Bryan Cranston, and Tom Bergeron. Rowling's episode was an edited version of her appearance on the original BBC series in 2011. Season 8 premiered on April 3, 2016. The list of celebrity participants included Aisha Tyler, Scott Foley, Lea Michele, Chris Noth, Katey Sagal, and Molly Ringwald. On June 9, 2016, the series was renewed for a ninth season to consist of 8 episodes which premiered on March 5, 2017. The list of celebrities that participated includes Jessica Biel, Julie Bowen, Courteney Cox, Jennifer Grey, Smokey Robinson, John Stamos, Liv Tyler and Noah Wyle. The series was renewed for a tenth season that premiered on May 21, 2018. The list of celebrity participants included Hilary Duff, Jean Smart, Jon Cryer, Laverne Cox, Megan Mullally, and Molly Shannon. The series has been renewed for its eleventh season that premiered on December 3, 2018. The list of celebrity participants includes Mandy Moore, Regina King, Josh Duhamel, and Matthew Morrison. Some of the biggest emotional and shocking highlights from past seasons. In Australia, season 1 began airing on the Nine Network on April 28, 2010. Season 2 and reruns of season 1 will now air on sister channel, GEM. For a reason unexplained by Nine, the episodes featuring Spike Lee and Emmitt Smith were not aired in the initial Australian screenings. In the Republic of Ireland, the first season of the US version began airing on RTÉ One on Thursday, May 27, 2010, at 22:25. The second series premiered on RTÉ One on Monday, July 4, 2011, at 22:40. In the United Kingdom, the first season of the US version began airing on BBC One on Sunday, June 13, 2010, at 21:15, the show received the same voice-over as the UK original series. The second series, premiered on Wednesday, November 16, 2011, at 22:45. The first episode shown was that following Steve Buscemi. The fourth series premiered on BBC1 at midnight on Tuesday, January 14, 2014. The order of celebrity is changed in the opening credits to Applegate, Clarkson, O'Donnell, Deschanel, Crawford and Parsons. Handler and Yearwood are not featured as they have little profile in the UK. In Sweden, the first season of the US version began airing with Swedish subtitles on SVT on Tuesday, September 14, 2010, at 13:20. In Greece, the first season of the US version began airing with Greek subtitles on Fox Life on Thursday, October 14, 2010, at 21:55. In Finland, the first season of the US version began airing with Finnish subtitles on MTV3 on Thursday December 30, 2010, at 20:00, called Sukujuuria etsimässä, "Looking for family roots". In Czech Republic, Slovakia, Hungary and Former Yugoslav republics, the US version airs on Universal Channel, the British version airs on Viasat History. In The Netherlands, the US versions of season 1 & 2 aired on August 8, 2013. In Italy, the show began airing on Studio Universal on February 4, 2013. Reruns of season 2 and season 1 began airing on LaEFFE since May, 2013. In Germany, it began airing on RTL Living on November 25, 2011. The network also aired the British version of the series on January 6, 2012. ^ Burstein, Nathan (January 21, 2009). "Lisa Kudrow's Family Tree". The Forward. Retrieved January 10, 2018. ^ Hinckley, David (February 28, 2010). "Everything now in 'Order' at NBC post-Leno shift". NY Daily News. Retrieved January 10, 2018. ^ Seidman, Robert (May 13, 2012). "'Fear Factor,' 'Minute to Win It,' Who Do You Think You Are?' and 'The Sing Off' All Canceled by NBC". TV by the Numbers. Retrieved August 29, 2012. ^ Stromblad, Cory (February 25, 2013). "Kelly Clarkson Embraces Her Southern Roots on 'Who Do You Think You Are?'". Taste of Country. Retrieved April 9, 2013. ^ "TLC Renews "Who Do You Think You Are?" and "Long Lost Family" for Additional Seasons". The Futon Critic. Retrieved February 15, 2017. ^ a b "TLC Reveals New Celebrity Contributors for "Who Do You Think You Are?"". The Futon Critic. Retrieved February 15, 2017. ^ Petski, Denise (August 25, 2017). "'Who Do You Think You Are?' Renewed By TLC". Deadline. Retrieved January 10, 2018. ^ Seidman, Robert (April 5, 2010). "NBC renews "Marriage Ref, "Minute To Win It," and "Who Do You Think You Are?"". TVbytheNumbers. Retrieved April 5, 2010. ^ "NBC Picks Up 'The Biggest Loser,' 'Who Do You Think You Are?' and 'The Sing-Off' For 2011-12". NBC. Archived from the original on 2011-02-26. ^ Goldberg, Lesley. "Martin Sheen, Reba McEntire, Rob Lowe Among 'Who Do You Think You Are?' Season 3 Cast". The Hollywood Reporter. ^ Nededog, Jethro (June 4, 2014). ""Who Do You Think You Are?" Season 5 to Feature Cynthia Nixon, Jesse Tyler Ferguson, Rachel McAdams". ^ "Updates On New Season Of "Who Do You Think You Are?" And TLC Network". July 23, 2014. ^ Nededog, Jethro (June 25, 2015). "Bryan Cranston and more to appear on new season of family history series 'Who Do You Think You Are?'". ^ Smolenyak, Megan. "New Season of 'Who Do You Think You Are?' Launching April 3rd". The Huffington Post. Retrieved March 6, 2016. ^ Meroski, Kate (April 27, 2018). "New Celebrities Trace Their Roots On Who Do You Think You Are". TLC. Retrieved April 28, 2018. ^ Wallace, Debra (November 3, 2018). "Mandy Moore, Josh Duhamel and Matthew Morrison Dig into Their Roots in Who Do You Think You Are?". Parade. Retrieved November 2, 2018. ^ Hipes, Patrick (July 12, 2018). "Emmy Nominations: 'Game Of Thrones' Tops Noms, With Netflix & HBO Leading Way – Full List". Deadline Hollywood. Retrieved July 14, 2018. ^ Littleton, Cynthia (September 9, 2018). "Anthony Bourdain, 'Jesus Christ Superstar' and 'Saturday Night Live' Win Big on Night 2 of Creative Arts Emmy Awards". Variety. Retrieved September 13, 2018. ^ Nguyen, Hanh (March 6, 2010). "TV Ratings: CBS edges out NBC Friday". ZAP2it.com. Retrieved April 5, 2010. ^ Seidman, Robert (March 6, 2010). "TV Ratings: Medium, Dateline Lead Night; Who Do You Think You Are Debuts". TVbytheNumbers. Archived from the original on March 10, 2010. Retrieved April 5, 2010. ^ Porter, Rick (March 13, 2010). "TV ratings: 'Numb3rs' finale leads CBS Friday". Zap2It.com. Retrieved March 13, 2010. ^ Seidman, Robert (March 13, 2010). "TV Ratings: Numb3rs Counted For the Last Time?". TVByTheNumbers.com. Archived from the original on March 15, 2010. Retrieved March 13, 2010. ^ Law, Christine (April 24, 2010). "TV Ratings: Family tree show helps NBC take a Friday win". ZAP2it.com. Archived from the original on June 27, 2010. Retrieved April 28, 2010. ^ Gorman, Bill (April 24, 2010). "TV Ratings: Dateline Leads NBC Win, As Food Revolution Ends Without A Bang". TVbytheNumbers. Retrieved April 28, 2010. ^ Porter, Rick (May 1, 2010). "TV ratings: CBS, NBC share Friday victory". ZAP2it.com. Retrieved May 1, 2010. ^ Seidman, Robert (May 1, 2010). "TV Ratings: Dateline Leads Friday Again". TVbytheNumbers. Retrieved May 1, 2010. ^ Seidman, Robert (February 7, 2011). "Friday Finals: No Adjustments for 'Fringe,' 'Supernatural,' 'Smallville' or Any Other Show's 18-49 Ratings". TV by the Numbers. Retrieved February 28, 2011. ^ Gorman, Bill (February 14, 2011). "Friday Final Ratings: 'CSI:NY' Adjusted Up; No Adjustment For 'Fringe,' 'Smallville,' 'Supernatural'". TV by the Numbers. Retrieved February 28, 2011. ^ Seidman, Robert (February 22, 2011). "Friday Final Ratings: 'Blue Bloods' Falls; No Adjustments for 'Fringe,' 'Smallville' and 'Supernatural". TV by the Numbers. Retrieved February 28, 2011. ^ Gorman, Bill (February 28, 2011). "Friday Final Ratings: 'CSI:NY' Adjusted Up; No Adjustments For 'Fringe,' 'Supernatural,' 'Smallville'". TV by the Numbers. Retrieved February 28, 2011. ^ Seidman, Robert (March 7, 2011). "Friday Final Ratings: 'Smallville' Adjusted Down, 20/20 Adjusted Up". TV by the Numbers. Retrieved March 7, 2011. ^ Gorman, Bill (March 26, 2011). "Updated TV Ratings Friday: 'Fringe' Rebounds, 'Shark Tank's' Mark Cuban Still Can't Beat The Donald". TV by the Numbers. Retrieved March 26, 2011. ^ Gorman, Bill (April 2, 2011). "TV Ratings Friday: 'Chaos' Bombs; 'CSI:NY,' 'Blue Bloods' Return Down; 'Shark Tank' Steady". TV by the Numbers. Retrieved April 2, 2011. ^ Seidman, Robert (April 10, 2011). "TV Ratings Friday: 'Chaos' Goes Even Lower and Takes 'CSI: NY' & 'Blue Bloods' Down With It; 'Shark Tank' Down". TV by the Numbers. Retrieved April 10, 2011. ^ The Futon Staff Critic (April 9, 2011). "Friday's Broadcast Ratings: 'Chaos' Craters in Second Week". The Futon Critic. Retrieved April 9, 2011. ^ a b "ShowBuzzDaily's Top 100 Sunday Cable Originals (& Network Update): 7.26.2015". www.showbuzzdaily.com. Retrieved August 11, 2015. ^ a b "ShowBuzzDaily's Top 100 Sunday Cable Originals (& Network Update): 8.2.2015". www.showbuzzdaily.com. Retrieved August 11, 2015. ^ "Who Do You Think You Are? DVD news: Announcement for Who Do You Think You Are? - Season 1". tvshowsondvd.com. Archived from the original on March 4, 2016. Retrieved January 22, 2018. ^ "Who Do You Think You Are - U.S." April 4, 2011. Retrieved January 22, 2018 – via Amazon. ^ "Who Do You Think You Are? (Usa) | DVD Movies & TV Shows, Genres, Special Interest / Documentary". Jbhifionline.com.au. Retrieved January 22, 2014. ^ "Who Do You Think You Are? : Season 2". May 1, 2012. Retrieved January 22, 2018 – via Amazon. ^ "Who Do You Think You Are? USA - Series Two". February 20, 2012. Retrieved January 22, 2018 – via Amazon. ^ "Who Do You Think You Are?". Channel Nine Australia. Archived from the original on May 2, 2010. ^ "RTÉ News". Archived from the original on May 30, 2009. ^ "Who Do You Think You Are? USA". RTÉ News. ^ "Who Do You Think You Are?". BBC. Retrieved January 22, 2018.